This article is about the American actor. For the English footballer, see Lou Costello (footballer). Costello in Africa Screams, 1949. 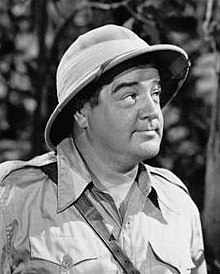 Louis Francis Cristillo (March 6, 1906 – March 3, 1959), professionally known as Lou Costello, was an American actor, best known for his film comedy double act with straight man Bud Abbott. Costello had started as an athlete, before working in burlesque on Broadway, where he stood-in for Abbott’s partner who had failed to show up. They formally teamed up in 1935. Their signature routine, "Who's on First? ", was carried through to radio and then to their film debut One Night in the Tropics (1940) and Buck Privates (1941). The duo would go on to make 36 films. During World War II, they were among the most popular entertainers in the world, and sold $85 million in war bonds. A winter tour of army bases caused a recurrence of the rheumatic fever which Costello had contracted in childhood, and his health was badly affected from then on, worsened by the death of his infant son. They launched their own long-running radio show in 1942, and then a live TV show. But by 1955, they were felt to be overexposed, their film contract was terminated, and the partnership split soon afterwards. Louis Francis Cristillo was born on March 6, 1906, in Paterson, New Jersey, the son of Helen Rege and Sebastiano Cristillo. His father was Italian (from Caserta, Italy) and his mother was an American of French, Irish, and Italian ancestry. He attended School 15 in Paterson and was considered a gifted athlete. He excelled in basketball and reportedly was once the New Jersey state free throw champion (his singular basketball prowess can be seen in Here Come the Co-Eds (1945), in which he performs all his own tricky hoop shots without special effects). He also fought as a boxer under the name "Lou King". He took his professional name from actress Helene Costello. On January 30, 1934, Costello married Anne Battler, a burlesque dancer. Their first child, Patricia "Paddy" Costello, was born in 1936, followed by Carole on December 23, 1938, and Lou Jr. (nicknamed "Butch") on November 6, 1942. On August 15, 1947, their last child, Christine, was born. As a young man, Costello was a great admirer of silent movie comedian Charlie Chaplin. In 1927, Costello hitchhiked to Hollywood to become an actor, but could only find work as a laborer or extra at Metro-Goldwyn-Mayer and Warner Bros. His athletic skill brought him occasional work as a stunt man, notably in The Trail of '98 (1928). He can also be spotted sitting ringside in the Laurel and Hardy film The Battle of the Century (1927). In 1929, with the advent of talking pictures, he headed back east intending to get the requisite stage experience. He stopped in St. Joseph, Missouri and convinced a local burlesque producer to hire him as a Dutch comic ("Dutch" was a corruption of "Deutsche", and the comic performed with a German accent). By the end of the year he was back in New York and soon began working in burlesque on the Mutual Burlesque wheel during the Great Depression. After the Mutual Wheel collapsed, Costello went to work for the Minskys, where he crossed paths with a talented producer and straight man named Bud Abbott. In 1935, they first worked together at the Eltinge Theatre on 42nd Street in New York City when Abbott's partner failed to show. Abbott and Costello formally teamed up in 1936. Reportedly, their first disagreement was over a booking in a minstrel show at the Steel Pier in Atlantic City, New Jersey. Costello wanted to take the gig, but Abbott was resistant. Costello offered to give Abbott a larger split of their salary, and Abbott agreed. Abbott and Costello were signed by the William Morris talent agency, which succeeded in landing them featured roles and national exposure on The Kate Smith Hour, a popular variety show, in 1938. The team's signature routine, "Who's on First? ", made its radio debut on Smith's show that year. Many of the team's sketches were further polished by John Grant, who was hired soon after the team joined the radio show. They had their own program, The Abbott and Costello Show, on radio from 1942 to 1949. Their success on the Smith program led to their appearance in a Broadway musical in 1939, The Streets of Paris. The following year they were signed to a movie contract with Universal Pictures. They only had supporting roles in their first picture, One Night in the Tropics (1940), but stole the film with their classic routines, including a much-shortened version of "Who's On First?" (a more complete version was performed in The Naughty Nineties, released in 1945). The team's breakthrough picture, however, was Buck Privates, released early in 1941. They immediately became the No. 3 Box Office Stars of 1941. The duo made 36 films from 1940 to 1956, and were among the most popular and highest-paid entertainers in the world during World War II. Among their most popular films are Buck Privates, Hold That Ghost, Who Done It?, Pardon My Sarong, The Time of Their Lives, Buck Privates Come Home, Abbott and Costello Meet Frankenstein and Abbott and Costello Meet the Invisible Man. The team also appeared on radio throughout the 1940s. On October 8, 1942, they launched their own weekly show on NBC, sponsored by Camel cigarettes. In the summer of 1942, the team went on a 35-day cross-country tour to promote and sell War Bonds. The Treasury Department credited them with the sale of $85 million in bonds. In March 1943, after completing a winter tour of army bases, Costello had an attack of rheumatic fever and was unable to work for six months. On November 4 of that year, he returned to the team's popular radio show, but upon arriving at the NBC studio, Costello received word that his infant son, Lou Jr., had accidentally drowned in the family pool. During an afternoon nap, the baby worked loose one of the slats on his crib, climbed out and fell into the pool, unnoticed by the nanny. The baby ('Little Butch') was just two days short of his first birthday. Lou had asked his wife to keep Butch up that night so the boy could hear his father on the radio for the first time. Rather than cancel the broadcast, Lou said, "Wherever he is tonight, I want him to hear me", and went on with the show. No one in the audience knew of the death until after the show when Bud Abbott explained the events of the day, and how the phrase "The show must go on" had been epitomized by Lou that night. Costello's close friend, Maxene Andrews of The Andrews Sisters, said that his entire demeanor changed after the tragic loss of his son, saying, "He didn't seem as fun-loving and as warm ... He seemed to anger easily ... there was a difference in his attitude." Also in 1943, he was drafted into World War II and went to court to seek a deferment. It was about this time that serious cracks began to appear in the relationship between Abbott and Costello. In 1945, when Costello fired a domestic servant and Abbott hired her, Costello announced that he would no longer work with Abbott. However, they were still under contract to Universal and required to complete two movies in 1946. They did Little Giant and The Time of Their Lives, but barely appeared together in both films and hardly spoke to one another off-camera. Abbott reached out to heal their relationship, suggesting that the foundation he and Costello had founded for underprivileged children be named the Lou Costello Jr. Youth Foundation, which touched Costello deeply. Their radio program moved to ABC (the former NBC Blue Network) from 1947 to 1949. It was pre-recorded. In 1951, the duo began to appear on live television, becoming one of the rotating hosts of The Colgate Comedy Hour (Eddie Cantor, Martin and Lewis and Bob Hope were among the others) and the following year they began their own filmed situation comedy, The Abbott and Costello Show. Costello owned the half-hour series, with Abbott working on salary. The show, which was loosely adapted from their radio program, ran for two seasons, from 1952 to 1954, but found long life in syndicated reruns. They were forced to withdraw from Fireman Save My Child in 1954 due to Costello's poor health — he had been plagued by heart problems all his life due to a childhood bout of rheumatic fever — and were replaced by look-alikes Hugh O'Brian and Buddy Hackett. The team could not reach a contract agreement with Universal the following year and left the studio after 15 years. Costello was surprised and honored by Ralph Edwards on NBC's This Is Your Life in 1956. By the mid-1950s, Abbott and Costello films were no longer box-office gold, and after failing to come to terms with the team, Universal dropped their movie contract in 1955. With radio, film and television vehicles, they suffered from overexposure, and were eclipsed by the team of Dean Martin and Jerry Lewis, who were the hot entertainment commodity that Abbott and Costello had been a decade earlier. In 1956, after troubles with the Internal Revenue Service forced both men to sell their large homes and the rights to some of their films, Abbott and Costello made their final film together, an independent production called Dance with Me, Henry. The film was a box-office disappointment and received mixed critical reviews[according to whom?]. Abbott and Costello dissolved their partnership in 1957 amicably. Costello went back to his roots of stand-up, including stints in Las Vegas, and sought film projects for himself. He appeared several times on Steve Allen's fledgling The Tonight Show, but most often in variations of his old routines, with Louis Nye or Tom Poston taking on the straight man role. Costello sought to be known as something other than the funny fat man in the baggy clothes, and in 1958, he played a dramatic role on The Tobias Jones Story episode of Wagon Train. Shortly after completion of The 30 Foot Bride of Candy Rock, his only starring film appearance without Abbott, Costello suffered a heart attack. He died at Doctors Hospital in Beverly Hills on March 3, 1959, three days before his 53rd birthday. Sources conflict on the circumstances of his last day and final words. By some accounts, restated in numerous "quotes" aggregates, he told visitors that the strawberry ice-cream soda he had just finished was "the best I ever tasted", then expired. By other reports, including several contemporaneous obituaries, the ice-cream soda exchange occurred earlier in the day; later, after his wife and friends had left, he asked his private-duty nurse to adjust his position in bed. "I think I'll be more comfortable", he said; but before the nurse could comply, he suffered a cardiac arrest and died. After a funeral Mass at his parish, St. Francis de Sales Catholic Church in Sherman Oaks, Costello was interred at the Calvary Cemetery in East Los Angeles, on March 8. His wife Anne died from an apparent heart attack nine months later on December 5, 1959, at age 47. Costello's older brother, Pat Costello (Anthony Sebastian Cristillo 1902–1990) was a stuntman and an actor, mostly performing the stunts in Lou's place. Costello's sister, Marie Katherine Cristillo (1912–1988) was married to actor Joe Kirk (Nat Curcuruto), who portrayed "Mr. Bacciagalupe" on the Abbott and Costello radio and television shows  and appeared in supporting roles in several of the team's films. Lou and Anne's second daughter, Carole, appeared in uncredited baby roles in several Abbott and Costello films. She went on to become a contestant coordinator for the game show Card Sharks as well as a nightclub singer. She died of a stroke on March 29, 1987, at age 48 while married to Craig Martin, eldest son of Dean Martin. Carole's daughter, Marki Costello, is an actress, director and producer in film and television. Lou and Anne's youngest daughter, Chris, published a biography, Lou's On First, in 1981. On June 26, 1992, the city of Paterson, New Jersey, in conjunction with the Lou Costello Memorial Association, erected a statue of Costello in the newly named Lou Costello Memorial Park in the city's historic downtown section. It shows Costello holding a baseball bat, a reference to the team's most famous routine, "Who's on First?". The statue has had brief appearances in two episodes of The Sopranos: "Big Girls Don't Cry" and "Cold Stones". The statue and the "Who's on First?" routine also featured in the film Paterson (2016). In 2005, Madison Street, in the Sandy Hill section of Paterson, where Costello was born, was renamed Lou Costello Place. The centennial of Costello's birth was celebrated in Paterson on the first weekend in March 2006. From June 24 to 26, 2006, the Fort Lee Film Commission held a centennial film retrospective at the Fine Arts Theatre in Hollywood. Films screened included the premiere of a digital film made by the teenagers of the present day Lou Costello Jr. Recreation Center in East Los Angeles. Also premiered was a 35 mm restored print of the Lou Costello-produced 1948 short film 10,000 Kids and a Cop, which was shot at the Lou Costello, Jr. Youth Center in East Los Angeles. In 2009, Costello was inducted into the New Jersey Hall of Fame. Abbott and Costello are among the few non-baseball personnel to be memorialized in the Baseball Hall of Fame, although they are not inductees of the Hall. A plaque and a gold record of the Who's on First? sketch have been on permanent display there since 1956, and a video of the routine loops endlessly in the exhibit area. ^ "Star Dust". The Mirror. 32 (1758). Western Australia. February 5, 1955. p. 13. Retrieved August 12, 2017 – via National Library of Australia. ^ "Films: LAST OF THE GREAT COMEDY TEAMS". The World's News (2571). New South Wales, Australia. March 31, 1951. p. 20. Retrieved August 12, 2017 – via National Library of Australia. ^ a b c d "Lou Costello, 52, Dies on Coast. Comic Had Teamed With Abbott. 'Little Guy Trying to Be a Big Shot' in Films and on TV-Partners Broke Up in '57". The New York Times. March 4, 1959. ^ Thomas, B. (1977). Bud & Lou: The Abbott & Costello Story. Lippincott. ISBN 9780397011957. Retrieved November 15, 2014. ^ "Public School #15". paterson.k12.nj.us. Retrieved November 15, 2014. ^ C. Costello (1961), p. 7. ^ a b c "Mrs. Lou Costello Fatally Stricken". Reading Eagle. December 6, 1959. Retrieved November 21, 2012. ^ "Daughter to Lou Costellos". The New York Times. August 14, 1947. ^ a b "Laurel & Hardy Films | Stills". laurelandhardyfilms.com. Archived from the original on February 5, 2012. Retrieved November 15, 2014. ^ Sforza, John: Swing It! The Andrews Sisters Story; University Press of Kentucky, 2000; 289 pages. ^ "Lou Costello Called. His Draft Case Is Transferred From Paterson to Hollywood". The New York Times. November 20, 1943. ^ C. Costello (1961), pp. 119–120. ^ C. Costello (1961), p. 120. ^ Fitzgerald, Mike. "Beverly Washburn Interview". Western Clippings.com. Mike Fitzgerald. Retrieved April 26, 2018. ^ "dying words". corsinet.com. Retrieved September 6, 2015. ^ "Death Takes Lou Costello". The Milwaukee Journal. March 4, 1959. Retrieved June 16, 2012. ^ Los Angeles Times, March 4, 1959. ^ Los Angeles Evening Mirror News, March 4, 1959. ^ "Lou Costello". Los Angeles Times. ^ "Costello Rites Held. Comedian Mourned by 400 at Requiem Mass on Coast". The New York Times. March 7, 1959. ^ "Lou Costello's Widow Passes". Sunday Herald. December 6, 1959. Retrieved November 21, 2012. ^ "Mrs. Lou Costello, 47. Widow of Movie Comedian is Dead in California". The New York Times. United Press International. December 6, 1959. ^ Eder, Bruce. "Joe Kirk: Biography". AllMovie. Retrieved February 12, 2015. ^ Nollen, Scott Allen (2009). "Appendix". Abbott and Costello on the Home Front: A Critical Study of the Wartime Films. Jefferson, North Carolina: McFarland & Company. pp. 192–199. ISBN 978-0-7864-3521-0. Retrieved February 12, 2015. ^ "Carole Costello, 48, Comic's Daughter, Dies". Los Angeles Times. Associated Press. April 3, 1987. Retrieved March 27, 2016. 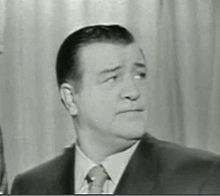 Wikimedia Commons has media related to Lou Costello.